Flowers? Oh No, We Can't Afford Those. Remember how floral gives me a giant headache? So, we got our floral estimate from Disney, and even though I was prepared to be shocked, I was still pretty flabbergasted at the price of what little floral we asked for. Bride's bouquet of red dahlia, eggplant mini calla lilies, purple hydrangea, purple lisianthis, and hot pink freesia; wrapped stem of ivory satin ribbon: $325. Did you do the math? That's $2,220.50 (plus tax) on just. Personal. Floral. I don't even have THAT big of a wedding party! (If you're wondering where the 11 boutonnieres come from, that includes 2 fathers, 1 grandfather, and the officiant.) Personal floral is the only floral/decor that Disney will allow us to use an outside vendor for, so you can probably guess what our decision was there. AND/OR floral 'cluster' tied with black & white ribbon to hang on the side of end chairs: $50 each. AND/OR black and white ribbon bows to hang on backs of chairs: $20 each. Granted, we will not have chiavari chairs at our ceremony, but this was the look we were going for. We decided to cut way, way down. We're going to just do two 'clusters' on either side of the first row, and then two ribbons on either side of the very last row. That way, if we do get moved inside due to weather, we don't have absolutely nothing. This brings our total ceremony floral cost to $140. To be clear - the upstairs will only be used for cocktail hour. The 'mezzanine' level, which is where many of our guests will be seated, is just those few steps up from the main floor. 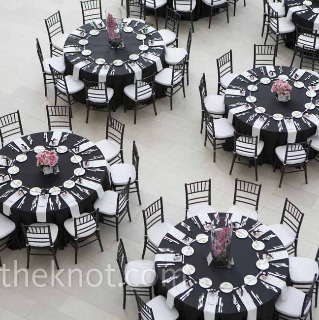 62 white chiavari black chairs with white cushions = $558. 10-inch rectangular vases for bouquets to go in - $10 each x 7 = $70. There wasn't a ton to cut here, frankly. (Though...it's all relative, and you might disagree!) The one big-cost item we could cut are the chairs, and...I don't want to. I might change my mind, but for now - I really think they'll make a big impact. We're doing so little in decor...and because of the multiple levels in the space, I can get away with only doing them on the main floor. $16.50 seems like a lot for scattered petals, but I think it will add a little luxury to a relatively simple design on the main floor. It's not like we have giant tall centerpieces - it's just the bouquets! We decided to forgo the flower petals on the 4-top tables though, because they're already pretty small - once the centerpieces, napkins, and table settings are there, I don't think you'd even see the rose petals. Choosing between the Monet vase and the bubble bowl, it was pretty much a toss-up, but I like that the bubble bowl actually had some color to it. Plus, it was a little cheaper. Bubble bowls it is! So. Once we subtract personal floral (to be explained in the next post), what we ultimately ended up with from Disney Floral adds up to $1,248.69, which includes tax and delivery fees. It doesn't sound so bad, really...until you realize how little it is. The chairs take up about half of that, and then we're getting about $600 worth of decor on top of those. Eh, whattayagonnado. I feel like we've cut down to as minimal as we'd like to get. Could we cut everything altogether if we really wanted to? I suppose...but it's not what I envision. Up next...what we're doing for personal floral!